IN MODERN world there are many new ways to produce everything in our country we are facing big challenge in production of energy. Energy can be reproduce by using various methods. One form of energy is electricity which is an important need to move the wheel of development & advancement of any country. Pakistan is one of the developing countries and facing shortfall of electricity. A low cost conventional solution can be the wind turbine. Its basic theory is interesting for engineering students and for those who have interest in sciences. 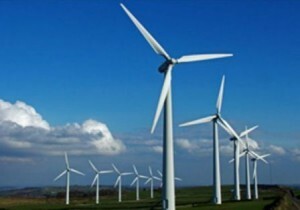 The wind turbine technology can be divided into different branches. Some of them are given below to understand its engineering. Basic Theory Aerodynamics is the science and study of the physical laws of the behaviour of objects in an air flow and the forces that are produced by air flows. The front and rear sides of a wind turbine rotor blade have a shape roughly similar to that of a long rectangle, with the edges bounded by the leading edge, the trailing edge, the blade tip and the blade root. The blade root is bolted to the hub. The radius of the blade is the distance from the rotor shaft to the outer edge of the blade tip. Some wind turbine blades have moveable blade tips as air brakes, and one can often see the distinct line separating the blade tip component from the blade itself. If a blade is sawn in half, one would see that the cross section has a streamlined asymmetrical shape, with the flattest side facing the oncoming air flow or wind. l Utility-Scale – Corresponds to large turbines (900 kW to 2 MW per turbine) intended to generate bulk energy for sale in power markets. They are typically installed in large arrays or ‘wind energy projects,’ but can also be installed in small quantities on distribution lines, otherwise known as distributed generation. Utility scale development is the most common form of wind energy development. l Industrial-Scale – Corresponds to medium sized turbines (50 KW to 250 KW) intended for remote grid production, often in conjunction with diesel generation or load-side generation (on the customer’s side of the meter) to reduce consumption of higher cost grid power and possibly to even reduce peak loads. Direct sale of energy to the local utility may or may not be allowed under state law or utility regulations. l Residential-Scale – Corresponds to micro- and small-scale turbines (400 watts to 50 KW) intended for remote power, battery charging, or net metering type generation. 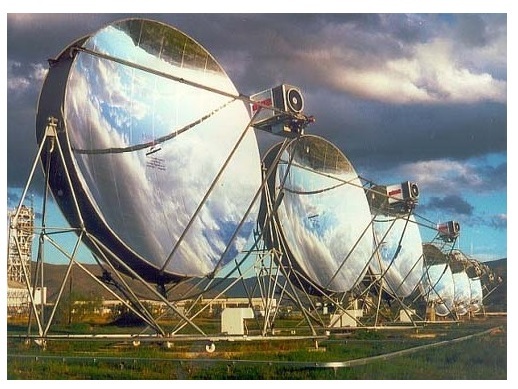 The small turbines can be used in conjunction with solar photovoltaics, batteries, and inverters to provide constant power at remote locations where installation of a distribution line is not possible or is more expensive. The technology, all commercially available, utility-scale wind turbines from established turbine manufacturers utilize the ‘Danish concept’ turbine configuration. This configuration uses a horizontal axis, three-bladed rotor, an upwind orientation, and an active yaw system to keep the rotor oriented into the wind. The drive train consists of a low-speed shaft connecting the rotor to the gearbox, a 2- or 3-stage speed-increasing gearbox, and a high-speed shaft connecting the gearbox to the generator. Generators are typically asynchronous, induction, and operate at 550-690 V (AC). Some turbines are equipped with an additional small generator to improve production in low wind speeds. 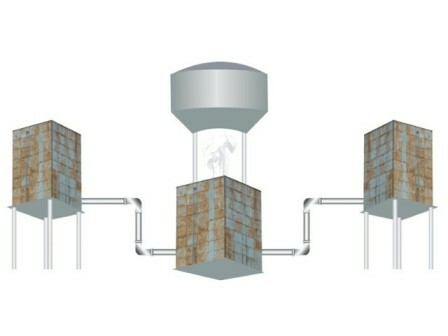 The second generator can be separate or integrated into the main generator. Each turbine for utility scale applications is equipped with a transformer to step up the voltage to the on-site collection system voltage. The on-site collection system typically is operated at medium voltages of 25 to 35kv power production from a wind turbine is a function of wind speed. The relationship between wind speed and power is defined by a power curve, which is unique to each turbine model and, in some cases, unique to site-specific settings. In general, most wind turbines begin to produce power at wind speeds of about 4 m/s (9 mph), achieve rated power at approximately 13 m/s (29 mph), and stop power production at 25 m/s (56 mph). Variability in the wind resource results in the turbine operating at continually changing power levels. At good wind energy sites, this variability results in the turbine operating at approximately 35 per cent of its total possible capacity when averaged over a year. Wind Turbine Features Optimum turbine size is heavily dependent on site-specific conditions. In general, turbine hub heights are approximately 1 to 1.4 times the rotor diameter. Project analysis conducted to identify the optimum turbine equipment typically results in a compromise between rotor size, hub height, energy production, component handling logistics, and cost. The control scheme employed to operate the turbine to produce grid-quality electricity varies among turbine manufacturers. No-one-control scheme is the ‘best.’ Each has advantages and disadvantages; however, they all successfully deliver energy into utility grids. Variable speed turbines produce energy at slightly higher efficiencies over a wider operational range of wind speeds than constant-speed turbines. The power electronics necessary in variable-speed turbines to produce grid-quality electricity consume slightly more energy than capacitors used to condition the power from constant-speed turbines. Variable-speed turbines also provide the ability for the turbine to supply reactive power to the grid and dynamically control the reactive power supply (power factor) to the grid. This feature can be advantageous to the operation of the transmission system particularly in remote portions of the transmission system where voltage control can be difficult and costly for the system operator to maintain. Typically, reactive power and its effects are managed through the use of larger conductor sizes, capacitor banks and special reactive power supply equipment. Remote wind energy projects that have the ability to produce or consume reactive power with either a static or dynamic power factor can mitigate costly equipment on the transmission system. Turbines that do not utilize variable-speed technology provide close to unity power factor by using switched capacitors at the turbine and, in some cases, at the project substation. The effect of constant-speed systems on the grid results in the consumption of reactive power. This reactive power must be supplied from other transmission system resources. Transmission system operators are increasingly interested in using remotely located wind energy projects to assist in providing voltage support and control. Fixed-pitch turbines generally have fewer moving parts and are less complex than variable pitch turbines, resulting in lower manufacturing costs. Variable-pitch turbines are able to optimize blade pitch and adjust it for changes in air density or blade contamination. For these and other reasons, the energy output from variable-pitch turbines is somewhat higher than fixed-pitch turbines, thus offsetting the higher system costs. In locations with large variations in temperature, and thus air density, fixed-pitch turbines can experience difficulties with excessive power production during periods of high air density if the blades are pitched in a manner that optimizes production throughout the year. The specific wind and climate characteristics at a given site ultimately determine which type of control scheme generates energy most cost effectively.